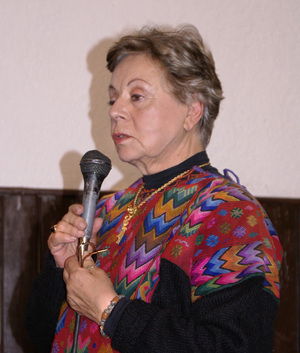 At the December 2007 Expo de Gastronomía in Morelia, Michoacán, Alicia Gironella de'Angeli comments on the importance of keeping a family cookbook. Mention Mexico's cuisines (both ancient and modern) and within moments you'll hear the names Alicia Gironella and Giorgio d'Angeli. The spouses have worked together for more than 30 years to promote, preserve, and protect Mexico's pre-conquest and mestizo kitchen traditions. It's been my honor to have known the two of them for several years. In the culinary world of Mexico, Alicia Gironella De'Angeli is ever-present, even when she is not in the room. A recognized authority on the cuisines of Mexico she is also a committed Slow Food officer and was part of the initiative that prepared and presented the proposal "People of Corn -- Mexico's Ancestral Cuisine" to UNESCO. She has devoted herself to research, investigation and rescue of the vast and complex cuisines of Mexico and with her husband Giorgio De'Angeli they have traveled the world, taught, and written on the complex nature and multiplicity of ingredients found only here. 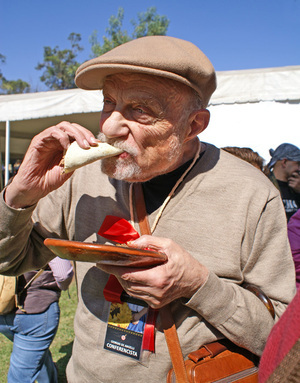 At the recent Muestra de Gastronomía in Morelia, Giorgio de'Angeli gobbled some slow food: tacos de borrego a la penca. Giorgio de'Angeli is a tireless laborer in the interest of Slow Food, the international movement founded in Italy in 1989 as a non-profit, eco-gastronomic member-supported organization to counteract fast food and fast life, the disappearance of local food traditions and people’s dwindling interest in the food they eat, where it comes from, how it tastes and how our food choices affect the rest of the world. In the defense of Slow Food, Sr. de'Angeli says, "No vertical food, please, and no fusion cuisine. Fusion cuisine ends up being CON-fusion. The Slow Food movement is about preserving and teaching real cooking, sustainable agriculture, eco-gastronomia, and tradition." Click here to learn more about Slow Food International. SLOW, the magazine of the Slow Food movement, is published four times a year in six languages. Over the last nearly 20 years, Alicia Gironella and Giorgio de'Angeli have written a number of books. 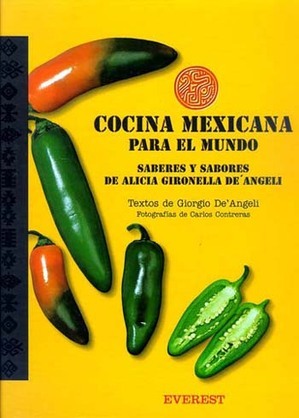 El Gran Libro de la Cocina Mexicana was published by Larousse in 1990. The five-volume set, in Spanish, includes volumes called La Cocina de la Imaginación, La Cocina de la Sencillez, La Cocina de las Sorpresas, La Cocina de las Especias y los Aromas, and La Cocina Barroca. The set is out of print. A volume or the entire set is occasionally available at specialty used and rare bookstores. 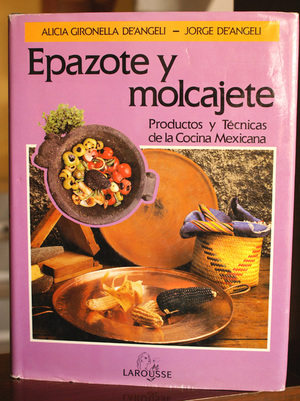 Epazote y Molcajete arrived in 1993. 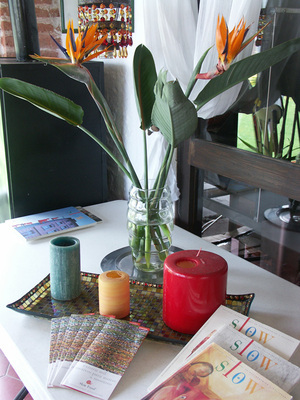 Everest Publishing offered Cocina Mexicana para el Mundo: Saberes y Sabores in 2003. 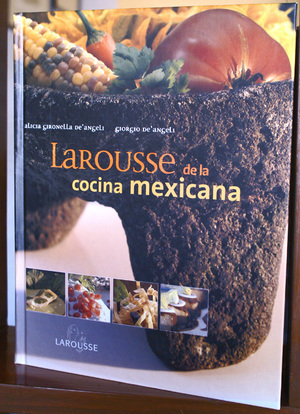 Larousse published this edition of the Larousse de la Cocina Mexicana in 2006, with a second edition in 2007. In this second edition of the Larousse, aesthetics and modernity share the pages with the indigenous and traditional, providing a concise guide for the professional and the novice alike. Alicia explains the work as "not a coffee table book" but as a text to be used in the kitchen, though the photographs by Federico Gil are breathtakingly beautiful. The book serves as a compendium of recipes with step by step instructions, techniques and methods, and a full descriptive of utensils commonly used in the Mexican kitchen. One of the sections deals with the importance of flowers as food and the preparation of this "gift of nature" transformed into a delicious meal. Moles as well are given an in depth view by region, method of preparation and according to place names. The de'Angelis masterwork is as easily used by the home cook as by the professional. Neither bogged down in historical detail nor lengthy socio-geographical analysis, the authors cut to the chase and give us what is arguably the most complete reference and recipe book on Mexican cooking. Larousse de la Cocina Mexicana is not only an homage to one of the richest world gastronomies, it is also a compendium of variety, tradition, and flavor. Its pages contain more than 500 recipes for main dishes, drinks, and salsas, from the simplest to the most elaborate and from the traditional to today's kitchen. The book has more than 800 photographs, step-by-step explanations of preparations, and numerous technical illustrations. Among the most useful and interesting details are comparative tables of moles, tamales, and salsas. The tables allow the cook to understand the similarities and differences among the various preparations. As Sra. Gironella commented "We have created this book to demonstrate the richness of a cuisine that is vast, creative and colorful. We tasted every recipe so there would be no doubt about its ingredients and preparation. If it weren't for the kitchen brigade at El Tajín (her restaurant close to Coyoacán in Mexico City), the book would not be what it is. I'm so grateful for their dedication and skill." 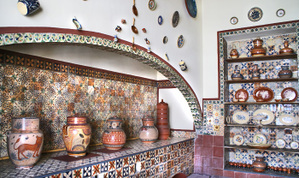 A classical Mexican kitchen, circa 1920-30. In addition to their multiple tasks as restaurant owners, writers and teachers, the de'Angelis are also part of the enormous effort with UNESCO to declare Mexico's corn-based kitchen a patrimony of humanity. Along with Gloria López Morales and several well-known Mexican chefs, the de'Angelis presented the cuisines of Mexico at UNESCO's Paris headquarters in 2006. Although the initial request for patrimony of humanity status was denied, the chefs agree that with or without UNESCO, Mexico's corn-based cuisines are a cultural and culinary heritage that must be preserved. Mexico has extraordinary regional cuisines, one for nearly every state, and the base of all these cuisines is three plants: corn, bean, and chile. The roots of Mexico's cuisines go back thousands of years, to an age and past comparable with other great civilizations. The de'Angelis and the rest of the chefs agree that there should be another presentation to UNESCO to plead the cause for patrimony of humanity status. Giorgio de'Angeli says that a great campaign is needed to make everyone conscious of Mexico's marvelous traditional cuisines. "Largely unknown internationally, indigenous cuisines are also little recognized here in the cities of Mexico. In both Mexico City and Guadalajara, there are more restaurants featuring foreign cuisines than those which feature traditional Mexican cooking. In my mind, that's clear evidence that certain sectors of society underestimate or know little about the greatness of Mexico's culinary culture." De'Angeli goes on to say that this expression of Mexico's national culture requires better definition of ingredients, utensils, and food preparation. Mexico's cuisines are as extensive as China's, as delicious as the cuisines of France, but they lack definition. Because Mexico's cuisines are so diverse, there is no single recipe, for example, for mole, for tamales, for enchiladas. Alicia Gironella de'Angeli graciously shared a simple traditional recipe with Mexico Cooks! 1. Grind the pumpkin seeds, corn, and chiles with a little of the broth. Strain and fry in the lard. Season with salt to taste. 2. Finish cooking the above paste with the rest of the broth. If you like, you can add potatoes, nopales, or cooked, sliced turnips. The pipián should be thick. 3. Serve in the shallow dish as a salsa for shrimp and potatoes. In 1993, Sra. De'Angeli opened a stunning new restaurant, El Tajín, on the outskirts of Mexico City. Some of the highlights on the menu are: fish steamed in a banana leaf with mushrooms and nopales (cactus paddles), various kinds of ceviche arranged like flower petals, seductive bisque-like soups and tantalizing fruit desserts, including one made of the sour cactus fruit xoconoxtle. "This is the same food we serve at home," Mrs. De'Angeli said. "It is one of two tendencies in Mexican cooking. The other is popular Mexican food, the kind with the grease and the cheese and everything fried. It is the traditional food that we are reinterpreting." Basically, she said, she is changing the presentation. Take the way she makes tortillas at El Tajín: the warm, flat corn cakes come with leaves of the fragrant Mexican herb epazote embedded in them, which gives them a stylish look. If you plan to be in Mexico City, make reservations and give yourself the extraordinary pleasure of dining in the traditional style. If you're very lucky indeed, you'll have an opportunity to meet both the de'Angelis. Be prepared to be ecstatic. Hours: Monday thru Sunday from 1 to 6 PM. Hello , My name is Noel Bohorquez and my parents, Carlos and Inez, are old friend of Alicia and Giorgio. I would very much like to get in contact with them. Is possible for this to be passed on to them? I would greatly appreciate this. Hi there! I must agree with Alex your photos are wonderful. I just received Alicia's Cocina Mexicana para el Mundo. 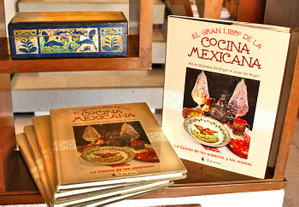 Do you happen to know if the book Larousse de la Cocina Mexicana has new recipes or if it is a compilation of old ones? Now if only I could find a copy of Ricardo Munoz Zurita's Diccionario Enciclopedico de la Gastronomia Mexicana I'd be set. I look forward to reading more of your blog. I love your photography Cristina- you feel as if you are there! I am intrested in the Pipian - if I dont have a source of black corn -what could I use? I think you could use any of the dried corns for pozole--red, white, or black if you can find it. If you use something other than black, your pipián will be just as delicious but not prieto (black).